ColourVue White Screen lenses are somehow unique among crazy contact lenses. Here, not only the iris is covered with the coloured pattern but also the pupil, which means that your whole eye is covered with a white mesh design. Thanks to this, your eyes look really freaky - a bit as if you had cataract but creepier. 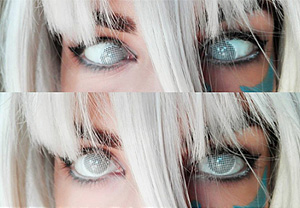 This effect they provide makes them perfect Halloween accessory - a pair of ColourVue White Screen lenses and you're ready to freak the hell out of people on any kind of horror-themed event. Because of the mesh covering the whole eye, it is not recommended to wear these lenses while driving.